New research is zeroing in on a significant correlation between oil and gas waste disposal and earthquakes in a two-county area in northern Oklahoma. In the past year, earthquakes have become common in Alfalfa and Grant counties along the Kansas border. The frequent shaking comes on the heels of a 500 percent increase in the amount of waste fluid being injected under the two rural counties. "Anybody can see that they are correlated," said Kyle Murray, a hydrogeologist with the Oklahoma Geological Survey who compiled the state waste disposal data. "I think the data kind of speaks for itself." That correlation, he noted, doesn't prove that the fluid disposal is causing the earthquakes. But he said it does provide valuable information. "There's numerous other factors that play into this," Murray said. Seismologists with the U.S. Geological Survey have found similar correlations in the area. Alfalfa and Grant counties are in the middle of the Mississippi Lime, an oil play where wells produce as much as 10 barrels of wastewater for every barrel of oil. In 2011, there were no earthquakes in either county. Last year, there were at least 177. The earthquakes in the area are also getting stronger. Six of the more than 50 earthquakes there since the beginning of the year have been magnitude 4 or greater, the level at which seismologists expect to see damage to buildings. Last year, there were only two quakes that big. Last week, the Oklahoma Corporation Commission, which regulates oil and gas in the state, ordered a SandRidge Energy Inc. disposal well in Alfalfa County to stop operations after a magnitude-4.1 earthquake. SandRidge is the dominant oil producer in the area, and inexpensive disposal is key to the company's strategy in the Mississippi Lime. The company has more than 186 disposal wells with a capacity of 2.5 million barrels (105 million gallons) a day in the area. In 2013, then-CEO Tom Ward said the company had worked to triple the capacity of its wells to lower costs. Alfalfa and Grant counties in Oklahoma. Map courtesy of Wikipedia. "The company has diligently built one of the world's largest saltwater disposal and electrical systems over the last three years to create a play that has very high rates of return," Ward said in a conference call with analysts. SandRidge owns 1.85 million acres of leaseholds in the play, according to the company website, with more than 11,000 potential horizontal drilling locations identified. SandRidge officials did not respond to multiple messages asking about the correlation between disposal operations and earthquakes. Amid the Mississippi Lime buildup, Alfalfa County has become the biggest in the state for underground disposal of waste fluid. In 2010, Alfalfa County disposal wells took in 19 million barrels of waste fluid, according to Murray's analysis of state data. That didn't even put it in among the top five in the state. In 2013, companies injected 225 million barrels of waste under the county. That is not only the most of any county in Oklahoma. It is 2 ½ times the amount injected in the next-highest county, Seminole. USGS scientists have also noticed the spike in earthquakes paired with oil and gas activity in the area. USGS geophysicist Andrea Llenos has looked at the rise of earthquakes along with the increase of both production and disposal wells in this part of the Mississippi Lime. "That's probably the most direct correlation," Llenos said. But she said there was a lag between when many of the wells were drilled, in 2011 and 2012, and when the earthquake rate sped up in 2013. Murray's report showed that the biggest jump in disposal volumes didn't come until 2013. The Mississippi Lime play extends across the straight-line border with Kansas, where earthquakes started occurring in September 2013. Llenos' USGS colleague Justin Rubinstein has studied oil production activities and earthquakes in the area. From mid-June to late July last year, he and his fellow researchers recorded more than 200 earthquakes in the area, ranging from magnitude 0.5 to 3.5. "We're seeing expansion of the field, followed by an increase in seismic activity," Rubinstein said. Often referred to as "salt water" within the industry, the wastewater from oil wells is many times saltier than ocean water. It can include fluid from hydraulic fracturing, oil byproducts and other toxic substances from the formation. Scientists have known for decades that injecting waste fluid in deep disposal wells -- from oil and gas or other industrial activities -- can cause earthquakes in rare cases. * One barrel is 42 gallons. 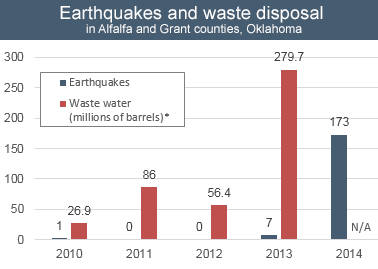 Data courtesy of Oklahoma Geological Survey, U.S. Geological Survey. The central United States, particularly Oklahoma, has seen a surge in earthquakes in the past few years. From 1975 to 2008, the whole state of Oklahoma averaged one to three quakes of magnitude 3 or greater a year, according to USGS. The number then rose abruptly. In 2009, it had 20 such quakes. In 2012, the number went over 100; last year it had more than 560 (EnergyWire, Jan. 5). Academic researchers and USGS have linked much of this increase to oil and gas activity, particularly waste fluid disposal. The link between earthquakes and drilling in Oklahoma has been actively discussed since at least November 2011, when the state was hit by its largest recorded quake. Many researchers have linked the magnitude-5.7 quake, which injured two people and damaged more than 200 homes and businesses, to disposal activities near the quake's epicenter. Industry and state officials have said those findings are premature. The Oklahoma Corporation Commission, which oversees oil and gas in the state, last year adopted what it calls the "traffic light" approach as it deals with the widespread shaking. Disposal wells in a swarm area within 6 miles of the center of a quake of magnitude 4 or greater are put in "yellow light" status. They get special scrutiny. The commission has temporarily shut down at least six disposal wells so they can be brought back into compliance. But Dana Murphy, one of the three elected commissioners who oversee the agency, has said the state might need to change course. "I get concerned about the piecemeal basis that we've been looking at it with," Murphy said during a public session last week. "Maybe we need to look at a broader scope."